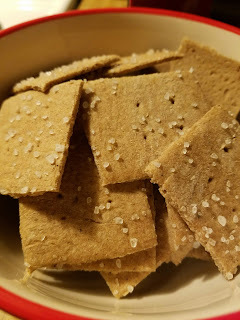 I have had some ideas for crackers in my head for a while. Tonight, I tried my idea and it worked. These are super simple to make. They remind me more of pita chips, I baked them crunchy crispy. 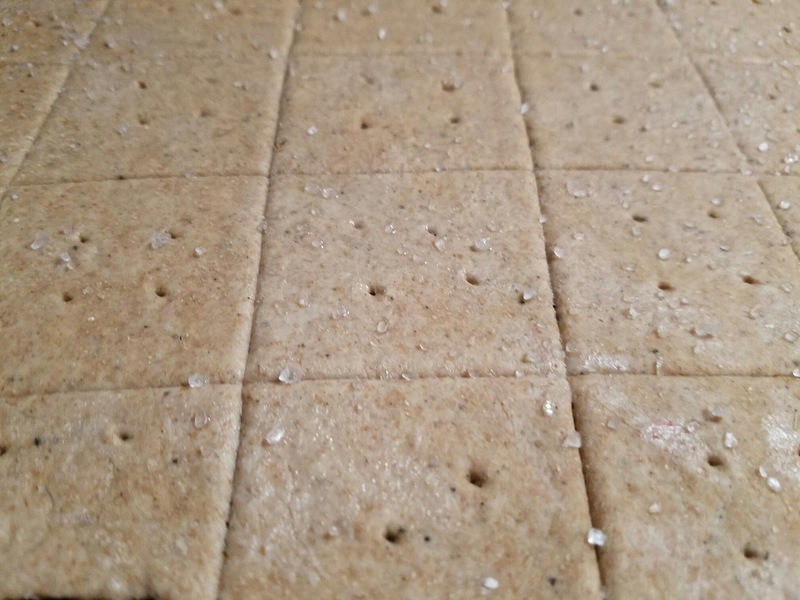 If you want them softer like a saltine, you would just need to make them less time. You can use spelt flour or brown rice flour for P1. Sprouted wheat for both P1 and P3. Add whatever spices you want- or none at all. 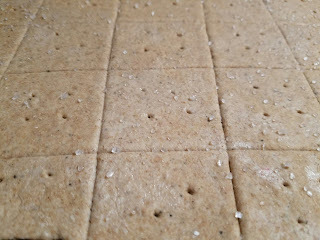 Roll these out on a silicone mat or parchment paper that you can slide right onto your baking sheet. They are rolled so thin, it is hard to move them without something under them. Score them, brush with water very lightly and sprinkle with salt. Bake. Super easy! Give these a go- I think you will like them! Mix dry ingredients in a bowl. Add half the hot water and stir. Add remaining water a little at a time, until dough comes together in a ball. I prefer the dough to be more sticky than dry, but not super sticky. Dust the counter with flour. Put dough on flour and sprinkle flour on top. Knead, adding more flour as needed, until dough is not sticky and is smooth, 2-3 minutes. 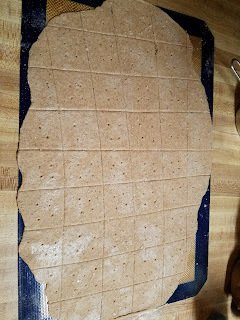 Place dough on silicone mat or large piece of parchment, and roll to desired thickness. Make sure the dough is very even, and that it is not bigger than your baking sheet. Use pizza cutter to score the dough into the size crackers you want. Brush very lightly with water and sprinkle with salt. Prick crackers with fork or skewer. Bake for 8-10 minutes, watching carefully. If you want them crisp, bake the longer time. If they start to brown to fast, turn the oven down. Do not walk away from these, they need to be watched. 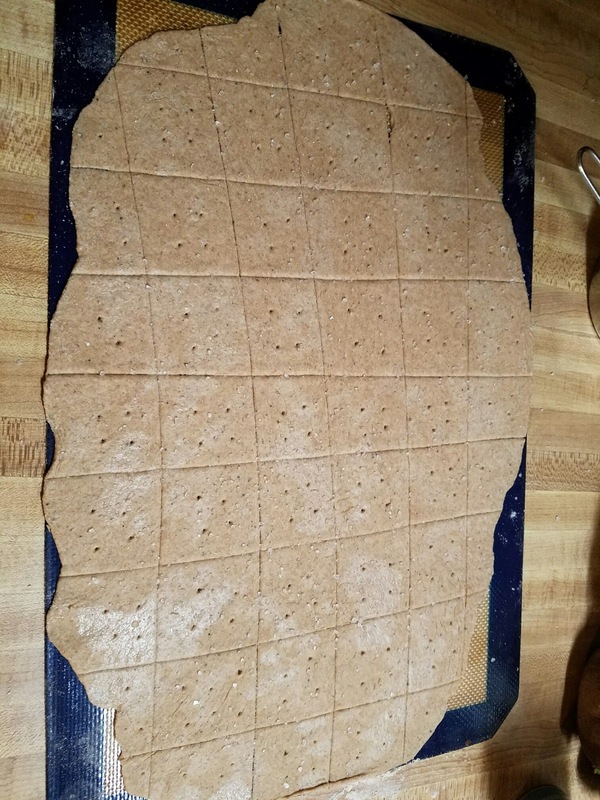 If the middle crackers are not getting as done as the outer edges, you may need to lift it up and slide a baking rack under and bake a couple more minutes. Let cool, break apart and let cool completely. Store in air tight container. Try adding chili powder, cumin, onion powder, curry powder, paprika or Italian herbs to change up the flavor.